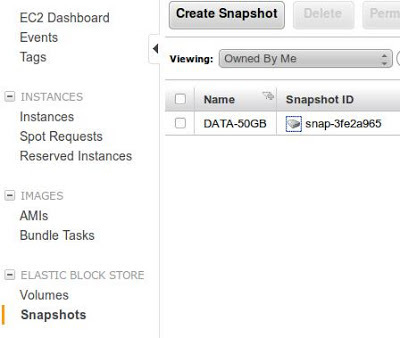 Most of us know that EBS snapshots have Amazon EC2 regional scope. In case you are planning to geographically expand or have data backed up on different Amazon EC2 region at regular intervals to minimize data loss and recovery time, you can use EBS snapshot copy feature for this purpose. The copied EBS snapshot behaves the same like regular snapshots, i.e. it can be used to create new EBS volumes which can then be attached to an EC2 instance in the destination region. Since the data is moved across regions in the form of snapshots, you will be charged only for the data transferred to copy the snapshot and to store the copied snapshot at the destination region. Unlike the create snapshot operation, which is incremental in nature, the EBS copy snapshot operation copies all of the bytes in the snapshot every time. It is recommended to use EBS snapshot copy once a day for larger databases with Multi region DR to reduce data transfer cost . Only if your DB is not a large one and you need better RTO/RPO + your IT budget can afford it, you should reduce this frequency accordingly. Configure MySQL on Amazon EC2 with Master-Slave mode. Freeze the file system and take regular snapshots in the source region. Copy these snapshots once or twice a day depending upon the RTO/RPO and DR budget using EBS Snapshot copy feature. Configure MySQL on Amazon EC2 with Master-Slave mode. Have another Slave running on Destination region which asynchronously updates records from the Master in source region. Secure the entire transport using SSL or VPN between regions. How to do Amazon EBS Snapshot Copy between Regions ? In this article we are copying a Snapshot from US-EAST Virginia Region to Asia Pacific Singapore Region. 3. In the EBS Snapshot page select the Snapshot ID you need to copy to destination region and Click Copy. 4. In the Copy snapshot dialog box you need to fill the following details. Description: Description of the snapshot. By default you can retain the one as shown in the below figure. 5. Click Yes, Copy button and the following dialog screen will be shown as confirmation. 6. To check the progress of the snapshot copy go to the Destination region (Asia Pacific Singapore in this case) and check the progress in the EBS snapshot page.